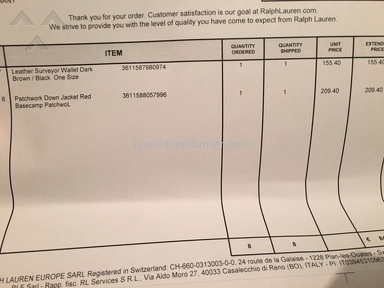 I have been an avid admirer and a regular customer of the brand Ralph Lauren for many years. This year however, I think you have hit it out of the ball park with your new collection of cardigans drawing inspiration from the Native Indians and one can say even the Maya culture of Latin and South America. Very appealing and comfortable. 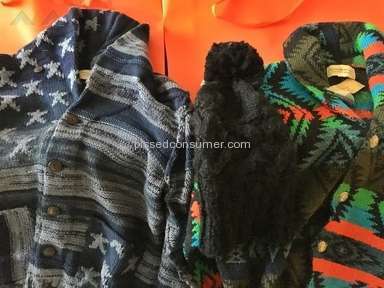 I myself bought a couple of the cardigans whilst I visited Stockholm earlier this Fall and even some jackets and sweatshirts whilst shopping in Berlin. 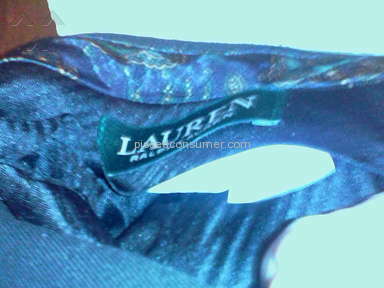 Ralph Lauren in the end of November had a sale advertising 40% discount on many of your items to my surprise. 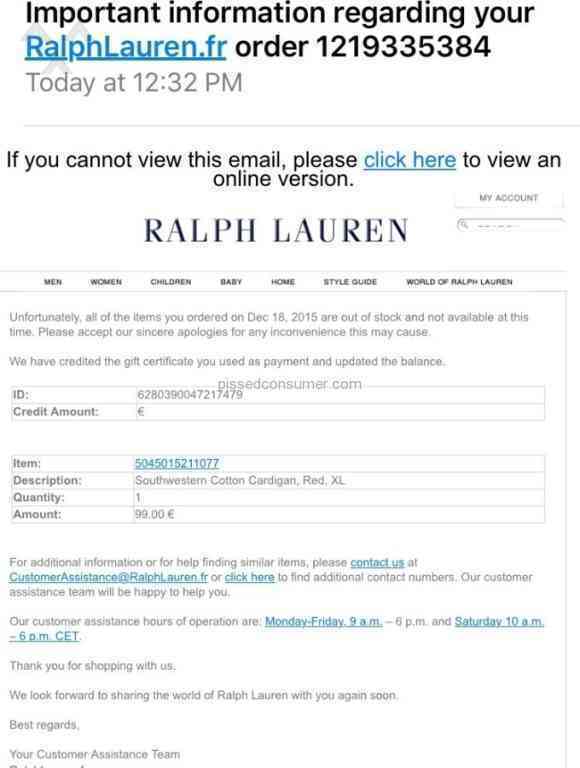 Therefore I made a large order for more of the collection online and had it delivered a week later. The goods arrived and all was fine except that the size of a cardigan was wrong. 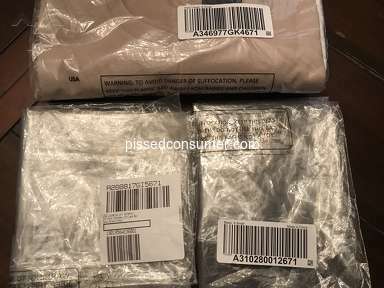 I proceeded to make an exchange and sent it back with the UPS service for the item to be exchanged. 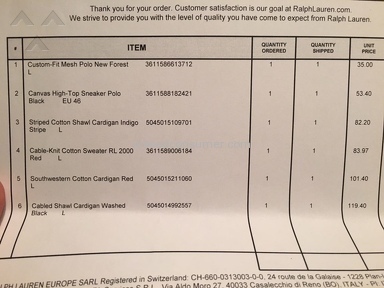 Myself, working as a Global Telecommunication Marketing Manager, I know that sometimes mistake are made, hence why I decided to call the customer service department of Ralph Lauren on the 10th of December this year to ensure that they understood that I had moved countrys recently and now wanted the item (the cardigan) to be returned to Amsterdam. I also wrote this on the return form and also provided my new address. 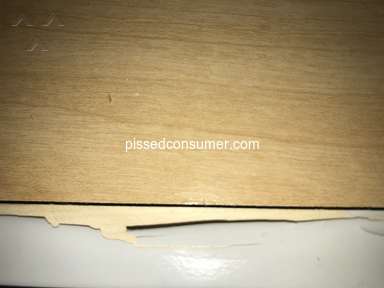 As I spoke to a customer service agent over the phone, the agent made notes and assured me that all was going to be fine. I followed this phone call up two days later, as I failed to receive an email informing me about the exchange as they had promised. I then spoke to a customer service agent in the UK who told me since I had moved country, they could only refund me as a gift voucher which I accepted. I waited a few hours and I was then on the phone with another agent and was then told that they would in fact refund me the value of the cardigan, to the original method of payment which was my credit card(PayPal)Now, I had previously on several occasions told the agents that I had moved country and no longer used my old credit cards. 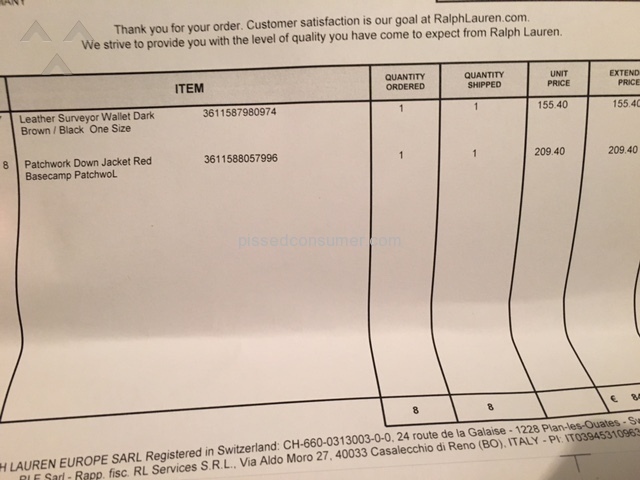 I specifically had asked for an exchange and not a refund and I had been told that they would refund the item in the form of a gift card so I could re-ordered on the www.ralphlauren.fr website and get it delivered to my new home address in Amsterdam. Last night finally someone placed the order and suddenly I got an email the next day that the item was out of stock. 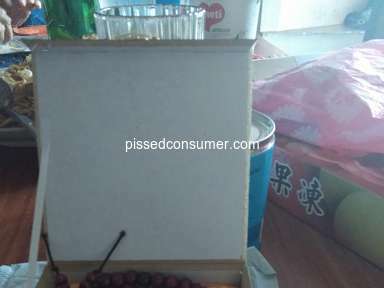 However, I called again this morning and suddenly the item was back in stock. I therefore tried to re-order the cardigan but this time their system had problems accepting my new address, and asked me to place a purchase request online, which I did while I was on the phone with them. After 40 minutes on the phone, I wrote the ID number and Pin Code of my gift certificate however it said that it was empty because they had not made the original refund. 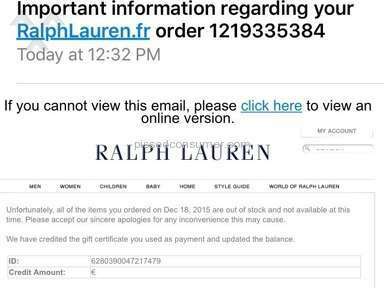 This is all very strange to me as I had earlier received an email from ralphlauren.fr explaining that that the money was back in my gift certificate and the Customer Service Adviser this time, a man named Andrew, told me to call on Monday because they had not had the time to put the money back into the gift certificate. After multiple, and multiple phone calls to try to order a simple new cardigan in my size, a whole customer service department of one of the major brands in fashion, could not assist me at all. I feel that I have waisted hours of time on the phone, hours I could have been more productive in my work with meetings. 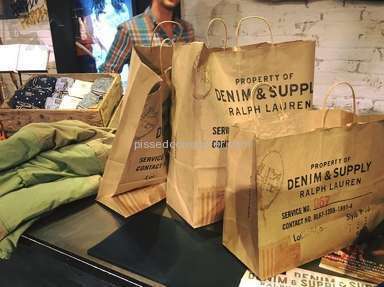 While I was in my office I was able to record some of these phone calls and I am more than happy to provide these to you to illustrate the utter inefficiency that the Ralph Lauren Customer Service Department is conducting. 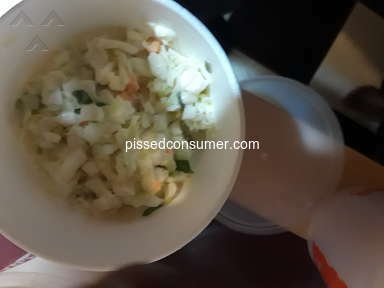 Even, one of their manager in the Uk site, told me that I was not allowed to record conversations, simply, I believe, to prevent negative exposure in social media and through customer feedback reviews. However, I did exactly as most companies do to me, I recorded our conversation for proof of unacceptable customer service. 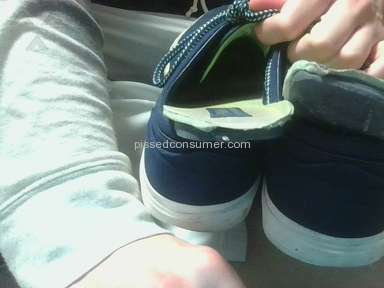 Lastly, I wish to say that I am deeply upset about this whole scenario and I will refrain from buying your brand as a result. Loosing a customer due to the above, should not occur. Review #754745 is a subjective opinion of Jdc34. 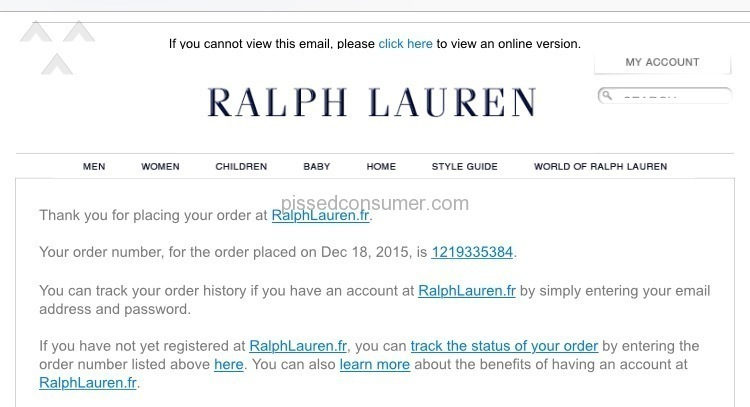 If Ralph Lauren spends the money to have its OWN U.S.customer service. It should train them to match the retail market they serve. 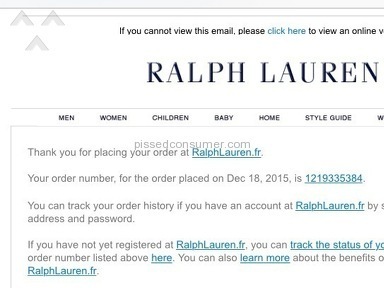 Messing orders up where customers lose the item they want to purchase due to inventory is unacceptable. It's bad when the customer service experience makes one think they're speaking with a out sourced group. 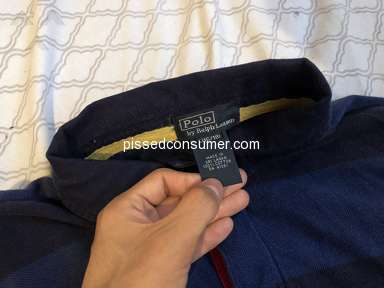 Ralph Lauren needs to improve their B2C because an item shouldn't become unavailable to them when a customer is checking out for example.I was having issues with the ordering process,and being misinformed by a representative which further held me up. By the time the order was submitted, an item I wanted was no longer available. Tried to speak with customer service to have the item allocated to my order because I had ordered more than one. Thus I wouldn't lose the item again because they could FIND it for me in their distribution,not possible. Disaster, customer service has no ability to view their OWN logistics system provided via a third party, or so I was told by the supervisor. 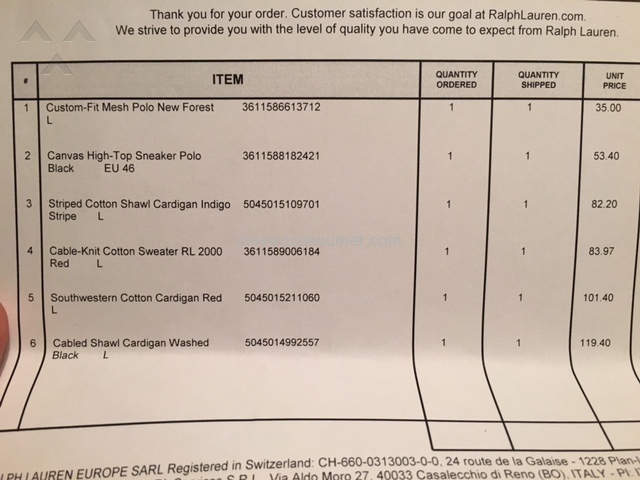 How does a company who sells luxury items not have an ERP system,yet a "non luxury" brand like Lands End is able to accomplish such a task to truly extend service?! 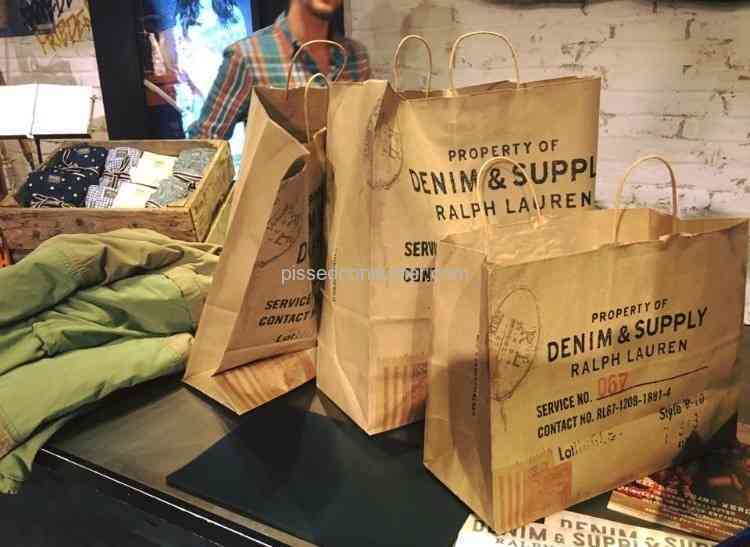 Also,they have better trained in country representatives* The B2C experience with Ralph Lauren certainly contradicts the saying "you get what you pay for."